(Newser) – Carriers of a specific form of the FTO gene, known as the "obesity gene," are 70% more likely to be obese, tend to have a bigger appetite, and weigh an average of 6.6 pounds more than non-carriers. 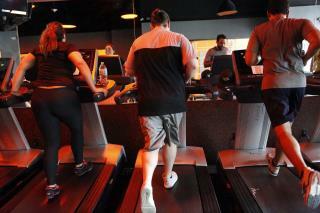 But, a new study finds, carrying the gene does not cause a person to be unable to lose weight. "You can no longer blame your genes," says the lead researcher in a press release. "Our study shows that improving your diet and being more physically active will help you lose weight, regardless of your genetic makeup." Researchers at England's Newcastle University reviewed eight randomized studies that involved 9,563 adult subjects and found that people with the obesity gene responded "just as well to weight loss interventions as everyone else," the lead researcher says. He adds, to Time, "You have to bite the bullet, and eat a bit less, or be more active [to maintain a healthy weight]." Incredibly lame. If you eat a plant based diet, avoiding processed carbs, you will not be able to remain fat. Even if you sleep all day. Oh holy cow! Move more eat less...took a study to prove that huh? Some people are going to be bigger than others. It could be genes. it could be medical reasons and it could be from medications that people are taking. There's always the person who overeats and underexercizes.